As you may know, running a successful locksmith business and a good website is tough work! I for one work hard to take original photos and write new content for my websites and locksmith blogs. However in recent weeks iv noticed a lot of my images getting ripped off and used on other locksmith sites. Ok you expect this to a certain degree its the price you pay for popularity on the web, however it really begins to P me off when rival locksmith companies, particularly national advertisers use images of me opening locks and working. This is both a breach of UK copyright laws and im sure some form of human rights laws. Firstly; I do not wish to be associated with a rogue poor performing national locksmith company that rips off its customers. Secondly; no credit is ever given for the use of your image or content and you will never benefit from it in the way of extra exposure or locksmith work. In fact this content theft can be harmful to your own locksmith website as google penalises duplicate content and can sometimes leave the offenders locksmith website ranking above you in the SERPS! So if you do spot this kind of content theft from your own sites you must act! Firstly contact the locksmith company directly, usually they have no knowledge of the theft of content as its usually left to an independant web designer. If they cannot get the content removed or at least link back to you in some form for the use of your work then it is worth threatening legal action to remove the content from the locksmiths website. I'v found that a lot of these locksmith companies are incredibly difficult to contact as they usually only display a premium rate number and no working email address or physical address. All the more reason to support the NO to nationals campaign over at http://www.locksmith-directory.org.uk and make sure these crooked locksmith companies die off as quickly as they spring up. During the colder months we locksmiths are going to be seeing an increase in multipoint lock failures. upvc and composite doors are prone to shrinking in the colder climate and will often stiffen up during the winter season. If your door starts to show resistance on the handle when pushing upwards usually accompanies by some sort of crunching sound you should get your door adjusted as soon as you can. Repeated stress on the locks gears will undoubtedly lead to failure, usually at the most inconvenent of times in my experience. Adjustment is usually a quick job for a skilled locksmith who will tweak the hinges and keeps to ensure the lock is meshing smoothly with the frame. It is part and parcel of owning a plastic door and will usually need readjusting in the summer months when things heat up a little. Here is another good article on upvc door maintenance written by Rickthepick. Have a merry Xmas and a happy new year. I recently spoke with a locksmith friend that works as a locksmith in Romford who encountered a common problem whilst servicing a particular brand of lock installed all over a large office block that he manages. These locks were oval profile mortice sash locks. If you aren't familiar with this type of lock they usually work by throwing the bolt which is then locked into place by a single lever. The problem this locksmith kept encountering involved the spring steel lever spring fracturing. This causes the bolt of the lock to fall between open and closed if the key is turned to quickly. When the user comes to unlock the door they find it wont work as the euro cam is trapped in the wrong part of the lock case by the intermittent bolt position. "replace the lever spring". LOL I never realised you could buy spare lever springs to make repairs like this and it is going to save a lot of hassle ordering a new lock case and of course the extra cost. It is simply a case of inserting the new lever spring into the groove and peening over the metal to hold it tight. Carefully bend the lever spring into position and try to get the majority of the bend in the first half inch so that it isn't too highly sprung at the other end which could cause it to jump out of position. 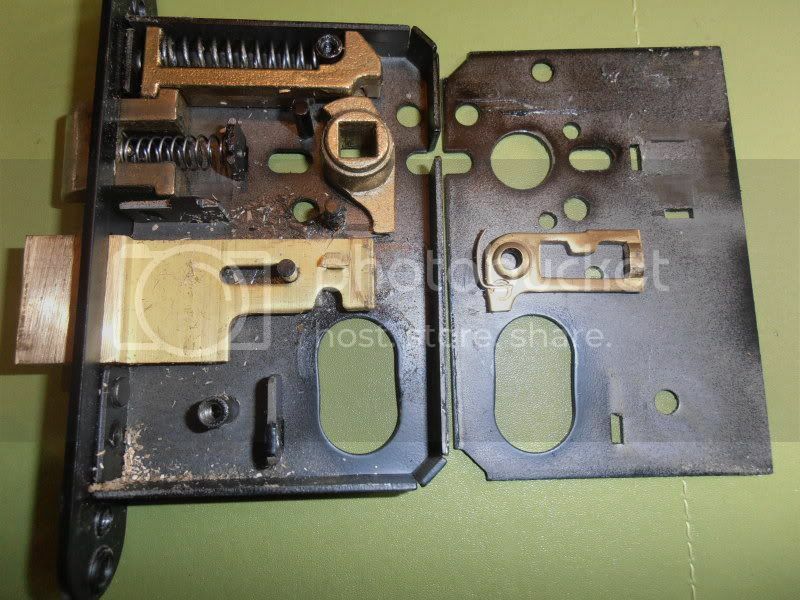 If the lock is beyond repair and a new case is required then try and order a superior model such as the Walsall ACE lockcase recommended to me by Walsall locksmiths. These incorporate a heavy duty machined piece to hold the bolts position as opposed the the lesser quality sprung lever as pictured above. Since the lock snapping technique was made public on the internet and on various television broadcasts, lock manufacturers have all jumped on the bandwagon to ensure they have a product on the market that meets the required standards. Publicising something like this has a knock on effect across the entire door and security industry, door manufacturers start looking for anti-snap locks to sell as standard with their doors, locksmiths start getting requests from concerned homeowners, insurance standards change requiring uprated locks on their customers properties.... the list goes on. A few years ago you were limited to a few brands that offered an antisnap version of their cylinders, now they are popping up left right and center and its difficult to know which lock to choose. Each has pro's and con's and Wolverhampton Locksmiths all have their own opinion on which is the best lock and which locks they choose to keep in stock. The sacrificial portion locks have a machined in weak spot so that any attempt to snap the lock out of the door will result in half breaking away leaving the rest embedded securely' in the door. This design is favourable as should leave the lock in working order and make it accessible to the owner or locksmith. The reinforced locks usually have some form of hardened spines or backbone to make the traditional snapping method more difficult. Whilst superior to the sacrificial lock in this sense it usually ends up worst for wear after a lock snapping attempt leaving the lock well and truly stuck in the door and none functional. These can be quite difficult to remove and may have also caused the gearbox in the mech to have been bent since all the force prying is transfered to the weaker casement. This with the addition to the anti drill properties of most of these anti snap locks has made gaining entry to faulty or jammed doors extremely difficult for locksmiths however whether or not it reduces the amount of break ins has yet to be proven and although a good deterrant do not stop a crook putting a brick through the window or gaining access via other means. Rogue traders get plenty of exposure in the news and on television however it seems the rogue customers are free to cause as much trouble as possible without any kind of exposure. Working as a self employed locksmith brings me into contact with rogue customers on a regular basis. One of my more recent 'customers' was locked out. Naturally as a 24 hour locksmith I dropped everything and drove the ten mile to the home of the customer who lived in an apartment block. I know the sure fire way to avoid this kind of scenario is to take card payment up front, but firstly you need the equipment to do so and I think it may put off some customers. You could demand payment for your time and have a good old argument about it however being a small self employed locksmith leaves you vulnerable to hoax calls and further trouble so i find its best to bite your lip and move on. Then there are the customers that want to haggle after the work is complete. This usually happens on those jobs you have already quoted at a reduced price for friends of friends or on particularly quiet weeks. I am all for haggling beforehand, its natural for a customer to try and get the best deal, in any trade not just locksmiths.Then there are customers that fall into the down right criminal category, usually larger companies that think they don't have to pay the small guy and will fight to the last straw to avoid parting with a penny. A recent post on a locksmith forum shows the trouble and financial problems a large customer can cause. Fortunately for this chap he had his day in court and won! I know a locksmith in Walsall that was recently swindled by a squatter claiming to live at a property.They had all relevant ID and utility bills linking them to the property so access was gained and locks changed. A few weeks later the cheque bounced and the customer upon further investigation through the letting agent turned out to be a serial fraudster named Tina Patel. So i guess my main gripe is that the spotlight is always on the tradesmen, when in fact there are far more 'rogues' and crooked customers out there waiting to rip off the next self employed guy that doesn't have the bottle or time to defend himself and I think its about time Domonic Littlewood and all his cronies start to fight for the victims on the other side of the coin for once instead of tarnishing good reputations. PSS locksmiths are the leading supplier of locksmith services in Sheffield. Providing professional locksmith services to businesses around sheffield and also catering for the domestic clients in the area. Rest assured PSS locksmiths are a local family owned business! Come highly recommended by the locksmith directory UK!